I know what you’re thinking: “ash, quinoa is so totally 2013.” AND YOU’RE RIGHT. but, as usual, i’m late to join the party. can I argue fashionably late with my new haircut? meh let’s not get caught up in details. the point is: I didn’t start adventuring with quinoa until last year. This sucker has been in my recipe arsenal for months and I’m just now pulling things out to post because, um, I’m moving and pretty much won’t have time to spend in my kitchen until I’m in New York…. For those of you who are staring at your screens like “keen-who?” let me help you out. 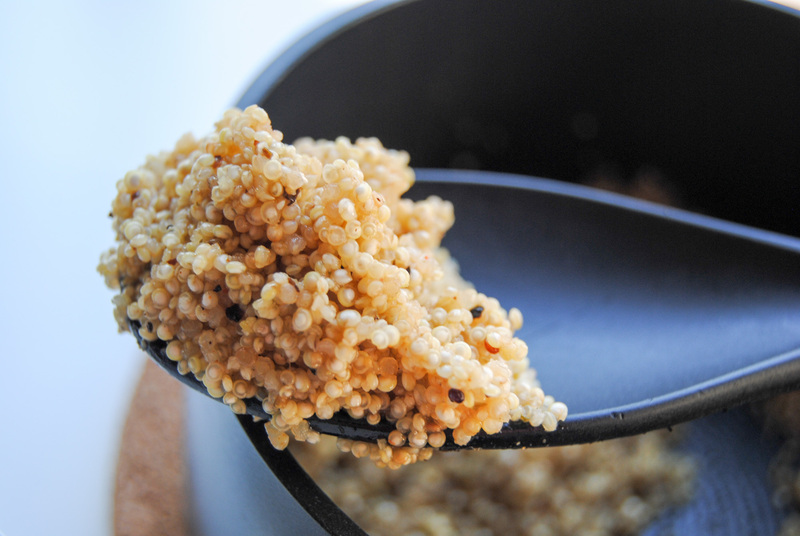 Quinoa is an ancient grain and superfood that looks a lot like couscous. What’s so special about it, you ask? It’s a complete protein, containing all 9 amino acids, andddd it’s gluten free. When cooked right, it can be light and fluffy with a slightly nutty taste. I like to use it as a rice substitute. There are two, very important, keys to cooking quinoa. First, make sure you thoroughly rinse and dry those seeds before you cook them! I use my fine mesh strainer and run cold water over dry quinoa for a couple minutes and then set the strainer on top of a towel to dry (I find that the towel soaks out the moisture and speeds up the drying process). Rinsing the quinoa removes a coating on the grain that causes a bitter taste. Second, use a 1:1.5 quinoa to water ratio. I’ve read a lot of places that say to cook quinoa like rice, with a 1:2 ratio, but I find that the extra moisture weighs down the quinoa and it doesn’t get as fluffy. That’s it folks! It’s pretty easy from there. I decided to make this another installment of the Cooking for One series because a lot of times I’ll just make a quarter cup of quinoa. You can easily adapt this recipe to make larger quantities, though – just up the main ratio (i.e. 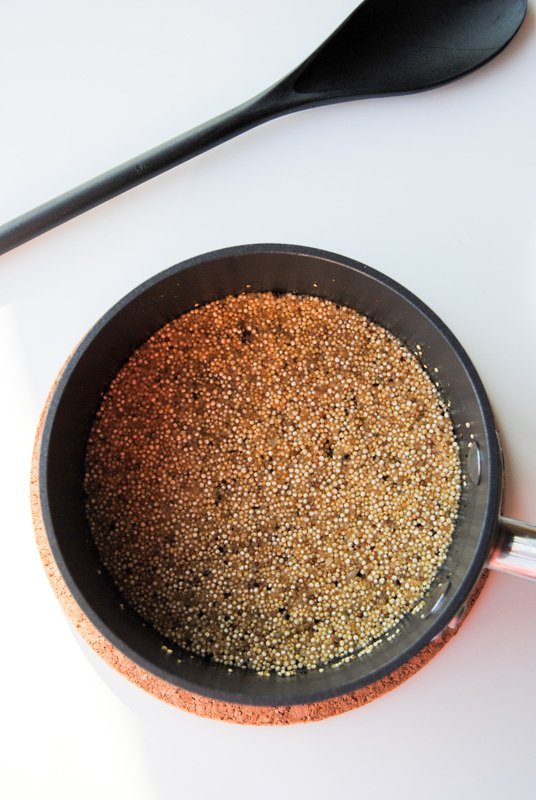 for 1/2 cup quinoa use 3/4 cup water or for 1 cup of quinoa use 1.5 cups water) and adjust spices to taste. The SPICES. 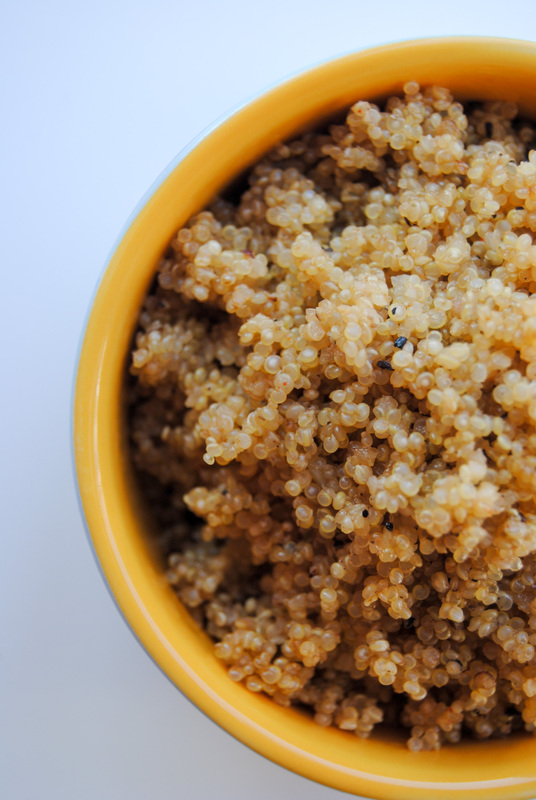 The spices are really what makes this quinoa recipe THE BEST (in my opinion). You can totally play around with what you use for spices/the amounts of spice you put in there. You do you. but this is exactly how I make my favorite quinoa. 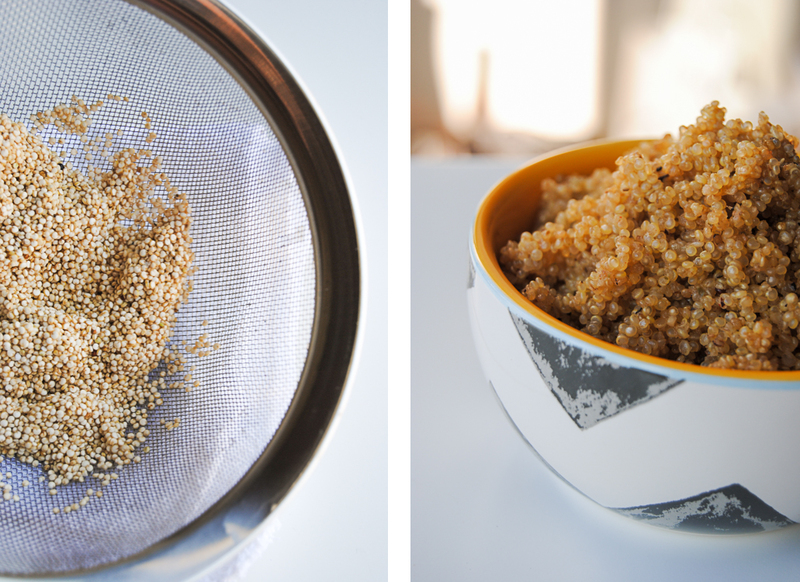 Using a fine mesh sieve, rinse the quinoa under cold water. Set quinoa aside and allow to dry (approximately 1 hour). Heat a small sauce pan to medium-high. Pour the quinoa into the pan with the olive oil and allow to toast for a minute or two. Stir constantly to prevent burning. Add in the vegetable broth (or water if you prefer water), Mrs. Dash, garlic powder, cayenne pepper, and cracked black pepper and stir. Bring to a boil, reduce the heat to low, cover and simmer for about 10-12 minutes. Remove the lid and fluff up the quinoa with a fork. If you still see a little liquid in the pan, cover and allow to simmer for another minute or two. Enjoy! Read: commence face plant. And to answer your question: yes, I did make the quinoa heart in the first picture. I’m so artsy.